Starbucks-Style Outrageous Gluten Free Oatmeal Cookies | Great gluten free recipes for every occasion. These days, whenever I have a new cookbook hit the shelves, I’m usually lucky enough to already be working on the next one. And that is 100% only because of your support. I don’t have a television show (nor do I want one—honest!) and I’m not part of some Big Food Blogger Circle that pushes all my books. I don’t have the sort of blog that is packed with comments from other food bloggers hoping to get you to click through to their blogs or to help me build my comment count. My Facebook page has real people on it, and I don’t have much of a presence on Twitter since I mostly just talk about my cat and dogs there. I don’t really think that’s what I am meant to be doing there, but that’s what I do. Oh, and I have exactly 2 photos on Instagram since I don’t take any pictures with my smartphone except for the occasional picture of one of my kids or (you guessed it) my cat or my dogs. I figure you don’t really care to see those, so I don’t ‘share’ them. I also don’t go in for “big announcements” or do tons of sponsored posts. And I don’t have a lot of friends, blogger-friends or otherwise. If it’s not authentic, I’m not gonna do it or else I won’t sleep much at night. That’s a long-winded way of saying this: I’m so glad you’re here, and I feel like I really reach you a few times a week. More than anything, I want to shift the conversation surrounding gluten free food. I want it to be just plain good, and I want to continually surpass expectations (mostly because I find they are so low). I believe we have the power to put downward pressure on gluten free food prices and upward pressure on quality. It is in that spirit that I tell you that my next cookbook will be filled with recipes for Gluten Free Classic Snacks. * Recipes for Pop Tarts and Hostess Cupcakes, Weight Watchers brownies and Keebler Town House Crackers, all made gluten free, each a dead ringer for the original. *ETA: The new cookbook is here!! 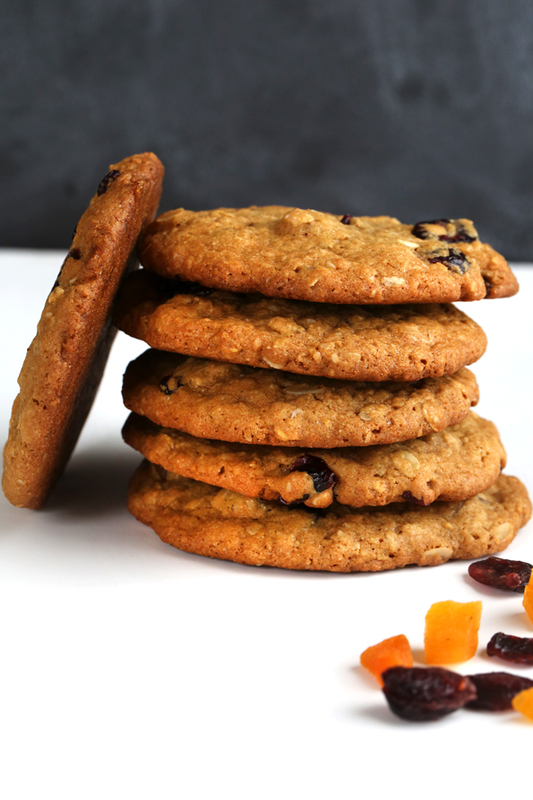 The ingredient list for these cookies is a wee bit longer than you might expect, but they’re unfussy and uncomplicated. And they might just be a comfort as you scan the baked goods case at Starbucks, waiting to order your (overpriced) coffee. If you only make them once, or (*gasp*) even if you never actually make them, it might just be nice to know that you can make them. 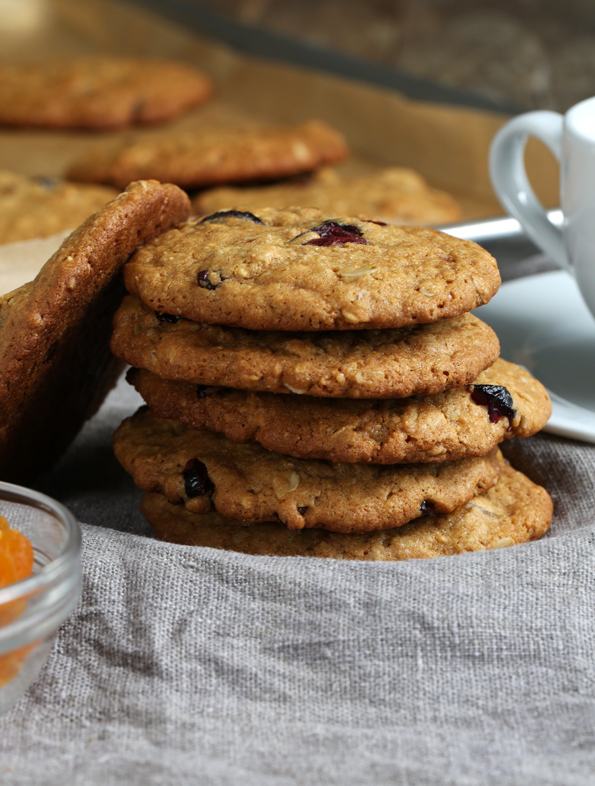 Buttery, chewy and (yes) outrageous, these are the gluten free oatmeal cookies to beat. And you? You’re the reader of my dreams. In a large bowl, place the flour blend, xanthan gum, oat flour, baking soda and salt, and whisk to combine well. Add the oats, granulated sugar and brown sugar, and whisk to combine again, working to break up any lumps in the brown sugar. Create a well in the center of the dry ingredients and add the shortening, butter, eggs, vanilla, honey and molasses, mixing to combine after each addition. The dough will be thick and you may have to knead it with your hands to get it to all come together. If it doesn’t come together, the ingredients specified to be at room temperature were likely not at room temperature. Toss the cranberries and apricots in the cornstarch, and add them to the dough. 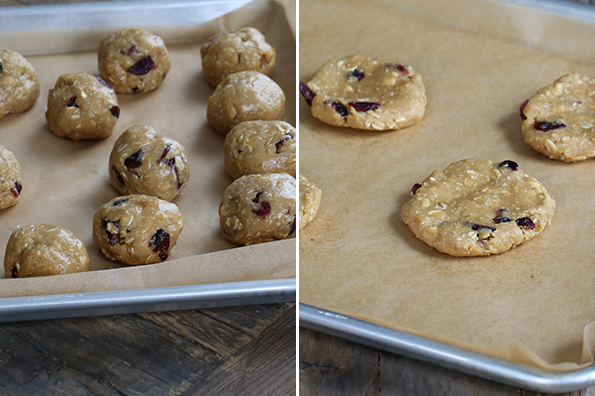 Mix until the dried fruit is evenly distributed throughout the dough. With wet hands, shape the dough into 1 1/4-inch round balls, and then press flat into disks about 1/4 inch thick. Place about 1 1/2-inches apart on the prepared baking sheets. Place in the center of the preheated oven and bake or until lightly golden brown all over and set in the center (about 12 minutes). Remove from the oven and allow the cookies to cool on the baking sheet until set (about 5 minutes) before transferring to a wire rack to cool completely. Could you sub choc chips for the fruit? I like the Enjoy Life brand:-) Also, sub butter for shortening? Thanks! Can I use maple syrup instead of molasses? No, Angela, maple syrup is not a substitute for molasses. I read your blog on a daily a daily basis, and quite enjoy it. my kids are long gone out of the house but I hope to be able to share these recipes with my 1 year old grandson, and when he is a little older bake some of your recipes with him, good food is the glue that binds families. I tried your starbucks cookie recipe but being cheap in my non gf days and now not being able to eat anything at starbucks, i’m not sure if mine taste the same are they supposed to be firm and chewy. mine came out kind of light and fluffy and about 3/4″ thick and very good. I had a hard time getting them 1/4″ thick because of all the dried fruit. 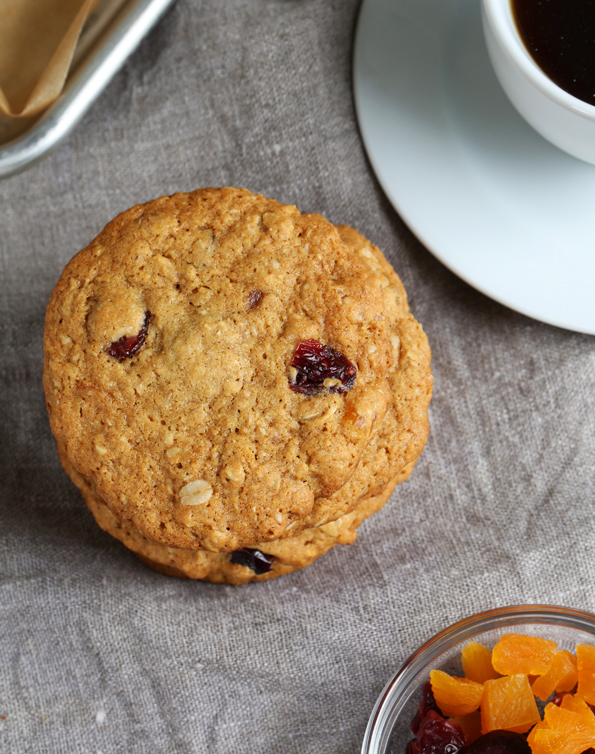 I didn’t have any dried apricots so I used raisins, oatmeal cookies should have raisins, with 3oz of dried cranberries and 3oz of raisins it came to about 1 1/2 cups of fruit, is that about the right amount. because they were thicker it took around 16 minutes to bake through. I really like the fell and texture when eating them. thanks for all the time and effort you put in to allow me to screw them up and try again. It sounds like your fruit was rather large, Paul. I’d try dicing the fruit next time. I am allergic to rice…. Any other combo of gluten frree flours you can suggest? I have used garfava bean flour and tapioca starch in recipes and they have turned out well. I’m afraid that most likely would not work in this recipe, Kelli. but feel free to experiment! Nicole, I love your blog and books and sense of humor. . And I should totally comment more often. Don’t worry, Brandy, I’m not able to take responsibility for what happens in your kitchen—for better or for worse! Love your blog! Can’t wait for the book. I do have one question about the recipe–do you think you can use coconut oil instead of shortening? Coconut oil isn’t generally a great sub for shortening, Lyn, since it is much softer at room temperature than shortening. Give it a try, though, since it isn’t that much! Depends on the room, I think! In the summer, my coconut oil is very soft (though not liquid). In the winter, it is much harder than my Spectrum shortening! Lyn, if you don’t want to use partially hydrogenated shortening, Spectrum is 100% unhydrogenated palm oil. Nicole generally uses it, so I suspect the recipe would work with that, and it’s a bit more natural of a product. Thanks Donia! I’ll give it a try. I made these cookies tonight. They were delicious! Thanks for another great recipe! Nicole, I love your blog and make your recipes all the time! I’ll be trying the cream puffs for V-Day. Any chance you’ll try making GF baklava??? I have a Turkish mother in law that has a very hard time with not being able to feed me (or my sweet husband who went GF for me) her homemade baklava. I’m trying to perfect the bread recipes to show her it is possible to make delicious bread GF but she would die of happiness to know that I can make her favorite dessert and be able to enjoy it with her. Ah, the ever-elusive phyllo dough, Heather! I have tried it in the past and got close but it was so hard to get it just right that I couldn’t share the recipe since I didn’t have faith that it was truly replicable by readers. I haven’t tried it with the new components in my bread flour from Bakes Bread, though, so that might work. You want to be good to your mother-in-law, and clearly you love her a lot. I’m a sucker for all of that! ;) I will keep at it. BTW… The Starbucks cookies look scrumptious. I’ve never had them either, but I will be making them. Maria, do it! I was petrified, but I did it. OMG, even though my bread did not get a high rise, it tastes fabulous. Now I look forward to it. Thanks Mare & Nicole. Sometimes we just need a swift kick in the you know what to get us going. I will attempt it this weekend since it looks like we’ll be home bound with lousy weather like most of the country. Stay warm ya’ll!! You’re not alone in finding yeast bread baking intimidating, Maria. It seems, to many, to be ‘hit or miss.’ It really isn’t, though. It is, however, unlike any other sort of baking. Even though it takes practice, though, the rewards are truly substantial as the process, not just the end result, are thoroughly enjoyable once you get the hang of it! Sounds like little round disks of heaven. I’m going to give it a try. I don’t go to Starbucks (gasp!) I make my own coffee at home, like a dinosaur right?! :0) And I’m not into Facebook or Twitter or Pintrest, it just sounds exhausting. So keep this blog going I’ll be here. Thanks for all the great yummy recipes, love them! Cannot wait! C A N N O T W A I T! Yay, you! I agree with Mare – this new book is going to be OUT OF THIS WORLD! I cannot wait for it. Can.not.wait. It will be the icing on the top of everything gluten free there is in this world and I’m beyond thrilled for you and us too! About your other comments (no friends, ahem – me, lady, me! )… You don’t have to do all that other crap because your recipes, blog, and cookbooks stand on their own. I’ve read around and everyone knows you are the bestie, best, best in the GF world, hands down. I adore when you post ‘copycat’ or ‘classic’ recipes like this – they make me swoon! Thanks for all you do! Aw, thanks, Jennifer! I don’t mean I don’t have many friends like I’m off eating my lunch at a table all by myself, hiding behind my retainer and frizzy hair. I just mean that I’m not the type, especially as an adult, to have lots of friends just to be able to count ’em up and feel good about myself. You know? Thanks so much for the kind words. You know they mean a lot to me! Nicole…I really appreciated your first paragraph..as a mom of one and wife to a GF husband finding good recipies for all can be difficult. As a family we don’t believe in using facebook or twitter and it can be so frustrating when you find a site and they say…go to my facebook page, or “like me” and we’ll share more info with you. Never stop doing your blog!!!! Its fantastic, easy to read and your recipes are a savior to us busy families who don’t have enough time or funds…to keep re-trying recipes…we need something we’re confident in doing right the first time. I used your angel food cake recipe at the holidays and it turned out great! I was given a copy of your first cook book for Christmas and already have marked a ton of pages to try. Keep up the great work and I’ll be keeping my eye out for the next book! Get the other two cookbooks and you will be rolling in gluten free goodness!!!! Thanks, Danelle! I see social media as a way to share what is already on the blog, but I don’t put exclusive content on there ever. I have used Facebook for live Question and Answer sessions after the bread book came out and that was extremely useful and something I just couldn’t duplicate elsewhere. But other than that, home is the blog! I cannot wait for that book, specifically for the coffee cake that I asked you to copy cat, to which you responded with “You have to wait until 2015 Mare.” I have been anticipating another amazing book since that comment! Do you have, or will you have, a Cheez-It copy cat? My most favorite cracker ever! Now, I just scrolled up and actually read the rest of blog post and saw “Devil Dogs” Oh Nicole please tell me that a Devil Dogs copycat is part of the new book! You truly are the blogger/author of my dreams! I contacted local Tucson GF bakery, Gourmet Girls Go Gluten Free, to see if they had any tips for bread baking in Tucson. They responded to me this morning and told me that, coincidentally, they just purchased GFOAS Bakes Bread and when they test the recipes, they will get back to me. Did I tell you that a co-worker tasted the lean crusty white bread and told me “you should open a bakery, Mare.” Not at all what I want to do. I just want to make and enjoy, and have my gluten eating family enjoy with me–which they absolutely do! You are the blogger/author of their dreams too! Oh, regarding today’s recipe, I never had Starbucks Oatmeal cookies. Not sure I will make these because of the amount of sugar in them. You see, I would eat them, and I am sure too many of them. They look like a cookie I would have absolutely no control over. Being diabetic, that is dangerous for me. I haven’t read the entire blog post, but they’d probably freeze well. I normally end up alternating the sugar amount. Normally. Not always. I didn’t realize you were diabetic, Mare. It can be rather hard to control oneself around these cookies, indeed! And so glad you’re really making a name for yourself with the bread! Your last set of comments hit the nail on the head for me. I may not make many of these recipes… BUT I CAN – if I wanted to :D. That alone is almost as good as eating the prize parcel itself! To die for…….thanks they are my fav.